The 2018 NCAA football season is quickly passing before our eyes as we’ve already reached the midway point of the year. With some impressive performances in hand, before we dive into the second half of the 2018 college season, we utilize PFF grades and data to look at which athletes have given us the top performances, week in and week out, at each position. 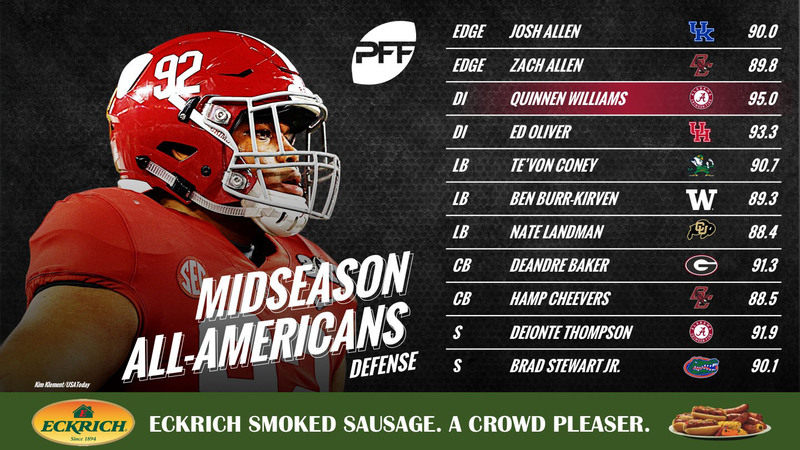 This Midseason All-American Team is brought to you by Eckrich, the Official Smoked Sausage of the College Football Playoff. 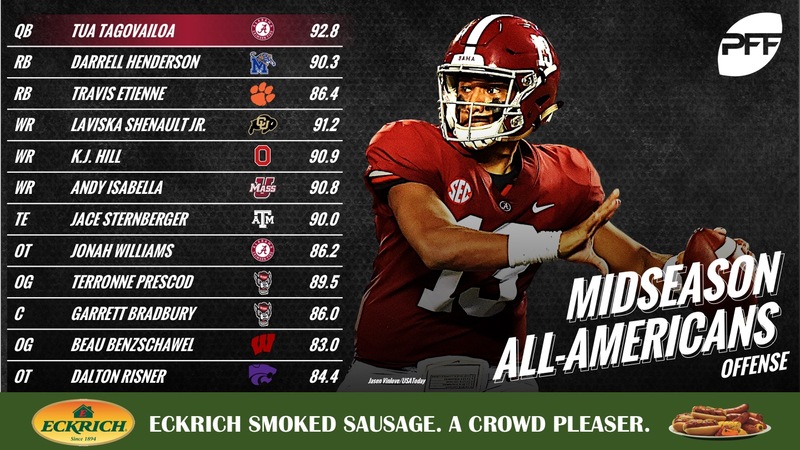 As always, our team of over 500 analysts has dissected and graded every snap of every game to bring you the most detailed and valid set of Midseason All-Americans that you can find anywhere. The gaudy stats and on-field performance match up well as Tagovailoa has shown incredible accuracy and performed well from a clean pocket (158.1 passer rating) and when pressured (112.5 passer rating). With a ridiculous 10.3 yards per carry and a nation-leading 6.7 yards after contact per rush, Henderson is off to one of the better statistical starts in history. Etienne has the top grade among Power-5 running backs with at least 70 carries. He’s forced 25 missed tackles on only 83 rush attempts, good for an outstanding elusive rating of 120.7. The nation’s top playmaker, Shenault has caught 83.6% of his targets and his 535 yards after the catch lead the nation by over 100 yards. Hill has been incredibly efficient as well, catching 85.1% of his targets while averaging 8.2 yards after the catch per reception. Isabella ranks second in the nation with 837 receiving yards including 7.3 YAC/reception and 11 avoided tackles on his 53 catches. Sternberger has emerged as the nation’s best receiving tight end in recent weeks, leading the way with a 91.9 receiving grade and 496 yards. He’s averaged 8.8 YAC/reception while forcing eight missed tackles and posting a solid 67.4 grade as a run-blocker. Williams and his counterpart have backed up preseason expectations as Williams has allowed only four pressures on 192 pass-blocking attempts this season. Williams has the edge as a run-blocker, ranking fourth in the nation with an 82.0 grade. Prescod has been outstanding in NC State’s zone-blocking scheme, posting the nation’s top grade at 90.6 while allowing only two pressures on 142 pass-blocking attempts. Bradbury has the best all-around performance among the nation’s centers, posting the top pass-blocking grade at 89.5 while ranking second as a run-blocker at 81.7. Benzschawel is close behind Prescod, grading at 81.1 as a run-blocker, good for sixth among guards while allowing only three pressures on 151 snaps in pass protection. Living up to the preseason billing, Risner has allowed just two pressures on 227 snaps in pass protection. With Ohio State’s Nick Bosa injured, the door is open for two ‘Allens’ to shine. Josh Allen has the top pass-rushing grade at 91.7, picking up six sacks, seven QB hits and 20 hurries on only 138 pass-rushes. He’s also been outstanding against the run (83.3 grade) and in coverage where he’s dropped back 83 times in Kentucky’s scheme. As for Zach Allen, he was a top-notch run stuffer last season, but he now has the No. 6 pass-rushing grade among edge defenders at 89.9 while tying for eighth in the nation with 32 pressures. No player has dominated quite like Williams this fall, posting the top grade among all defensive players due to his disruptive nature against both the run and the pass. His 96.1 grade against the run tops all interior defensive linemen and he’s tied for second with a 90.4 pass-rush grade. Oliver is doing his usual fine work in the run game, raking second in the country with a 93.4 grade, but he’s taken his pass-rushing to the next level with an 88.0 grade, good for fourth. Coney has elevated his game in coverage this season, grading at 90.6 while allowing a paltry passer rating of only 30.5 on throws into his coverage. Burr-Kirven has been a tackling machine, leading the nation with 69 solo tackles by PFF numbers, but his 34 stops and 90.2 coverage grade are the more impressive numbers. As for Landman, he’s done his best work in the run game with a 90.2 grade that ranks sixth, but he also has two interceptions and a pass breakup while allowing just three receptions in coverage. Baker maintains his preseason top spot among cornerbacks, leading the nation with a 91.5 coverage grade as he’s allowed just 117 yards on 30 targets to go with two interceptions, eight pass breakups and a 32.2 passer rating against. Cheevers has similar numbers as he’s allowed just 16-of-40 targets to be completed into his coverage, breaking up four and intercepting another four, good for a passer rating against of only 20.3. While he’s cooled off from his hot start, Thompson is still the top playmaking safety in the nation as he leads the way with a 91.0 coverage grade while picking off two passes and breaking up five passes. Stewart is grading at 90.4 in coverage as he’s broken up two passes and interception two more, including a critical pick-6 against LSU.